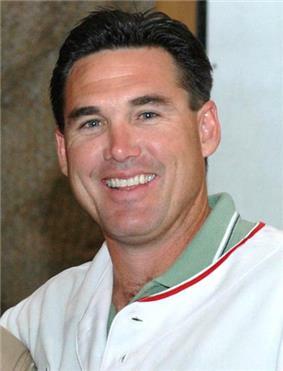 Timothy James "Tim" Salmon (born August 24, 1968) is a former Major League Baseball right fielder and designated hitter who played his entire career with the California/Anaheim/Los Angeles Angels (appearing with the team under all three of its recent names). Known affectionately among Angels fans as the King Fish, he is considered one of the greatest players in the Angels' franchise history. Salmon who had been selected in the third round of the Major League Baseball Draft in 1989 out of Grand Canyon University in Phoenix, made his major league debut in 1992, the same year that he won the Baseball America Minor League Player of the Year Award. In his first full season the next year, when he hit 31 home runs with a .918 OPS, Salmon was named the 1995, when he won a Silver Slugger Award, finished third in the league with a .330 batting average, and posted an OPS above 1.000. That year, he was the first major league player to get a hit off future closer for the New York Yankees, Mariano Rivera. He finished seventh again in 1997 when he had a career high 129 RBIs. After playing in fewer than 100 games in 1999, he tied a career high 34 home runs in 2000. From 1993 to 2000 he only had two OPS lines below .900 and he never finished below .860. Before the 2001 season, Salmon, who was about to finish a four-year contract signed before the 1997 season, briefly considered signing with the Arizona Diamondbacks, but instead signed a four-year, $40 million extension with the Angels. Salmon's 2001 season was largely disappointing as he finished with career lows for full seasons in a number of categories. Nevertheless, he followed it up with what may have been his most meaningful season. After a resurgent regular season for which he was named the AL Comeback Player of the Year, Salmon was a crucial part of the Angels' playoff and World Series run in 2002, hitting two key home runs in Game 2 of the World Series against the San Francisco Giants and batting .346 with a 1.067 OPS in the series overall. Following a solid 2003 season, Salmon appeared in only 60 games for the Angels in 2004. After being sidelined for the entire 2005 season to recover from left knee and right rotator cuff surgery, a return was doubtful. Deciding against ending his career on those terms, however, Salmon dedicated himself to becoming healthy enough to play one final season in 2006. On December 2, 2005, the Angels announced that they had agreed to terms on a minor league contract with Salmon, making him a non-roster invitee to the team's 2006 spring training. Though he preferred to return to the Angels, Salmon was aware that he was considered unlikely to make the team's roster, but he saw the opportunity to play with the team during the exhibition season as a chance to potentially audition for other teams. However, Salmon turned in a surprisingly strong performance during Spring Training and secured a role for himself with the Angels. At the end of the exhibition, the team announced that Salmon had made their roster, meaning he would earn a $400,000 salary for the 2006 season. Salmon spent the season as a designated hitter and reserve outfielder. He indicated that making it through the season successfully would mean that he accomplished his goal of being able to end his career on his own terms. In any respect, Salmon's 2006 season was a significant improvement over his meager 2004 campaign. He finished the season with an .811 OPS over 76 games, having passed 1000 career RBIs and boosted his career home run total to 299. Despite setting the Angels' franchise record for home runs and finishing his career with over 1,000 RBIs, Salmon was never selected as an All-Star during his 14-year career. Salmon's career home run total is the highest for any player in MLB history who played most of his career after the first All-Star game in 1933 to have never been selected to appear in an All-Star Game. On September 28, 2006, Salmon announced he would retire at the end of the 2006 season. He played his final Major League game on October 1, 2006, against the Oakland Athletics. His name and jersey number were cut into the infield and outfield grass of the playing field at Angel Stadium. He returned to Angel Stadium as a player in the 2010 All-Star Legends and Celebrity Softball Game where he received a standing ovation before hitting two home runs for the American League and receiving the game's MVP award. Salmon's number (15) with the Angels has not been retired yet, but it has not been used by an Angel since his retirement. When Dan Haren was traded to the Angels from the Arizona Diamondbacks on July 25, 2010, he requested number 24 instead of his usual 15 out of respect for Salmon. As of 2014, Salmon is a pre-game and post-game analyst for Angels games on Fox Sports West. As of the end of the 2006 season, Salmon is the Angels' all-time leader in home runs (299), runs scored (983), walks (965) and slugging percentage (.499). He is second in franchise history with 1016 RBIs, behind Garret Anderson. He is one of only two Angels' players to have won the Rookie of the Year award. Salmon's second cousin is actress Holly Hunter. Salmon is the founder of the Tim Salmon Foundation, which supports children in need. He now lives in Scottsdale, Arizona, with his wife and four children: Callie, Jacob, Katelyn, and Ryan. ^ a b DiGiovanna, Mike (2010-07-05). "Dodgers' Eric Karros and Angels' Tim Salmon were stars . . . just not All-Stars". ^ Scarr, Mike (September 28, 2006). "Salmon officially announces retirement". losangeles.angels.mlb.com. Retrieved February 11, 2014. ^ "The Fabulous Forum". Los Angeles Times. July 11, 2010.